Having active, attractive and engaging social media profiles is no longer a bonus in most industries - it's essential. That goes double for fashion brands, where beautiful imagery is everything and competition is fierce. We wanted to take a look at which UK fashion brands have nailed it when it comes to generating a large following, looking across a range of social media platforms - Facebook, Twitter, Instagram and Pinterest - to see who is truly leading the charge in the social media stakes. 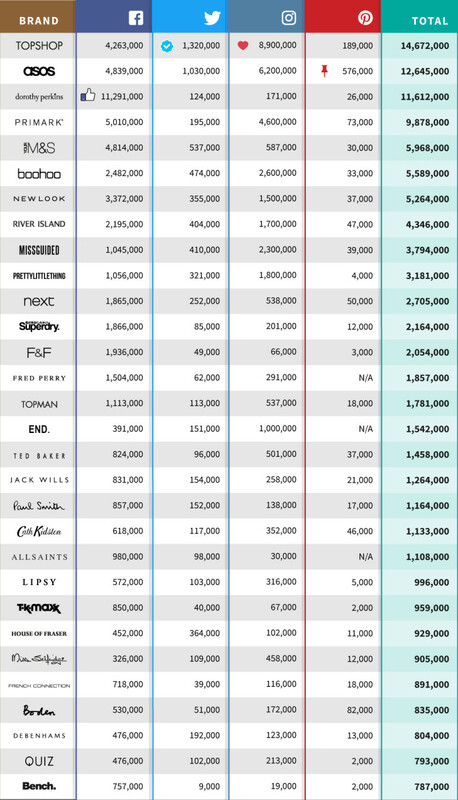 We looked at 70 of the UK's biggest fashion brands - so some of the big names like H&M (Swedish) and Zara (Spain) didn't make the cut - and ranked them by their total social following. Some of the big names were ever present, but there were some surprises in there too - you can see the top 30 in the table below. The full dataset offers insight into all 70 brands included in our research, and reveals some very interesting facts about the state of fashion brands on social media (data correct as of 22nd-23rd June). 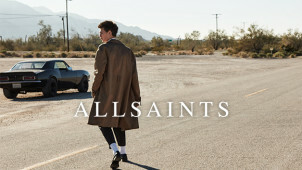 Topshop rolling in in first place - despite Topman having its own range of social media profiles - spoke to the benefit of having a brand with a little legacy, with ASOS falling back into into a perhaps surprising second place. British High Street staples Dorothy Perkins, Primark and Marks & Spencer completed the top five, beating out some of the newer and trendier brands like Boohoo, Missguided and PrettyLittleThing (despite their far younger target and social-savvy customer bases). Brands that missed out on the top 30 altogether included ASDA George, Burton, Simply Be - and even the likes of Matalan, Monsoon and Warehouse. Topshop and ASOS sweep to the front of the pack because of their comparatively huge Instagram followings - 8,900,000 and 6,200,000 respectively. Dorothy Perkins falls into third despite being utterly dominant on Facebook, with well over double the numbers of followers of any other UK fashion brand. Twitter, perhaps surprisingly, lingered a long way behind Instagram and Facebook in terms of the average number of followers, though Pinterest performed far worse. This perhaps speaks to the difficulty brands face in using Pinterest for marketing, alongside the struggle Pinterest has faced while trying to commercialise its offering - even in an image-heavy industry like fashion. Only 14 of the top 70 UK fashion brands on social media have a verified Pinterest account, all of which were in the top 30; in fact, there were 6 brands that didn't have a Pinterest account at all. The Facebook verification system - with grey ticks and, eventually, blue ticks - also provided some interesting data. Blue ticks are only given to 'eligible brands, media organizations and public figures', and five of the brands outside the top 30 apparently haven't made the cut yet (the largest of which is probably Debenhams). One thing that we couldn't investigate was the number of fake followers across the brands we looked at - something that's obviously quite influential when it comes to the raw total number of followers. A very quick check using some free tools gives a figure off 88% real followers for the likes of @Topshop on Twitter, for example - a very good figure for an account with that many followers (all accounts will naturally draw fake followers, after all). Instagram especially may be prone to inflated follower numbers, and research into the number of fake followers could be quite interesting. Data was collected between the 21st and 22nd June, and the raw data can be found via the following spreadsheet. For the final table, follower numbers were rounded to the nearest 1,000 - as this is the top level data given for Facebook and Instagram accounts were you are not the account owner. However, both datasets can be found via the above. Don’t compromise between trend setting fashion and your bank balance. Indulge your love of fashion without feeling guilty thanks to vouchercloud’s women's fashion vouchers. We’ve got plenty of discounts to satisfy all of your fashion needs and keep your purse feeling healthy at the same time. From high street heavy weights like Dorothy Perkins, Topshop and New Look to top designer brands including The White Company. Find top fashion styles for less when you shop with an Asos discount code, alternatively find all your favourites at House of Fraser with our range of voucher codes, you can rest assured your wardrobe will be stocked up this season without you wincing at your overdraft. Whether it’s a big night out your planning or you have a special occasion to attend you’ll find loads of women's fashion discount codes you can use to keep the cost of your outfit down. Our partywear and designer voucher codes might just leave you enough cash left over in your budget for a few new accessories too. Plus, with ASOS, boohoo.com and Missguided discount codes being constantly updated right here on vouchercloud you will find savings on everything from wedding outfits to Halloween costumes. Is your everyday wardrobe looking a little sad? Discover discounts on denim to die for from the Gap to savings on smart tailoring for the office courtesy of M&S or get more money off with a Debenhams discount code, plus lounge wear and Saturday coffee morning essentials from Joules, Boden and Jack Wills. Who knows, you could receive free delivery, money off your total basket or even exclusive offers on particular seasonal trends.